BMW Korea said Monday it would continue its efforts in sustaining growth and seeking co-prosperity with the community. From social responsibility programs to direct investment, the local branch of the German carmaker will inject 1 trillion won ($927.2 million) and buy 10 trillion won worth of auto parts from local partners. Last May, the company opened a regional distribution center in Anseong, Gyeonggi Province, to cater to the growing need for the efficient and speedy supply of auto parts. The 130 billion won project is the largest distribution center by BMW in the world, and is expected to create 600 new jobs, the company said. BMW Korea and its affiliates donated 3.9 billion won in 2017 to operate other community programs including a safety class for kids and vocational education sessions for teenagers. 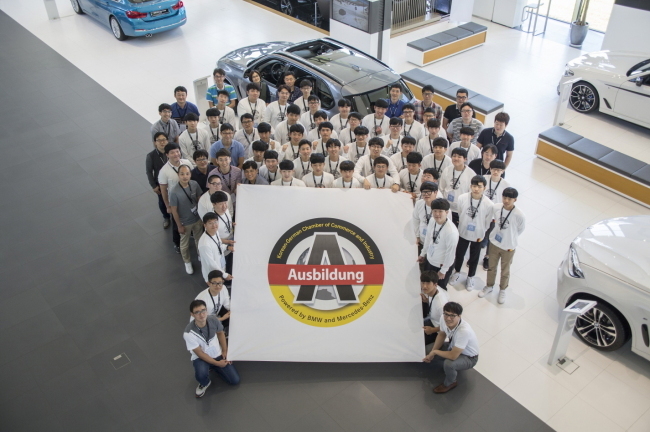 In a joint venture with the German Chamber of Commerce last year, BMW Korea launched a vocational training program called Ausbildung, a three-year program designed to nurture auto technicians here. A total of 90 trainees are currently under training and part of the group will be offered jobs at BMW Korea.